Most of the Express tools discussed so far are available as options in the Express pull-down menu. There are some additional options in the pull-down menu you won’t see in any of the toolbars. You won’t want to miss these additional tools. They can greatly enhance your productivity on any type of project. Throughout this book, you’ve been learning about the keyboard shortcuts to the commands of AutoCAD. All of these shortcuts are stored in a file called Acad. pgp in the \Program Files\AutoCAD 2000\Support\ directory. In the past, you had to edit this file with a text editor to modify these command shortcuts (otherwise know as command aliases). But to make your lives simpler, Autodesk supplies the Command Alias Editor, which automates the process of editing, adding, or removing command aliases from AutoCAD. In addition, the Command Alias Editor lets you store your own alias definitions in a separate file. You can then recall your file to load your own command aliases. Here’s how the Command Alias Editor works. Choose Express > Tools > Command Alias Editor. The AutoCAD Alias Editor dialog box appears . As you can see from the button options, you can add a new alias or delete or edit an existing alias. If you click the Add button, you see the New Command Alias dialog box. In this dialog box, you enter the desired alias in the Alias input box, and then select the conunand from the list box below. You can also enter a command or macro name, such as Wipeout, in the input box. When you click the Edit option in the AutoCAD Alias Editor dialog box, you see a dialog box identical to this one with the input boxes already filled in. When you are done creating or editing an alias, click OK. 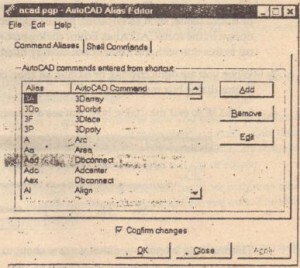 The AutoCAD Alias Editor dialog box reappears. Click OK to exit the dialog box. You see a warning message. This message is telling you that you are about to overwrite the Acad. 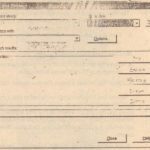 pgp file. Click No to leave the Acad . pgp file untouched, The Save As dialog box then appears. In the Save As dialog box, enter an alternate filename, such as Myalias.pgp, to store your personal set of command aliases. Once you’ve entered a name and saved your settings, a message appears telling you that your new settings have taken effect. Click OK to return to AutoCAD. 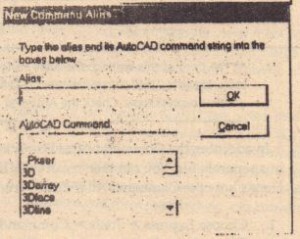 If you’re a veteran AutoCAD user, you may have become accustomed to your own set of command aliases. If so, you may want to leave the original Acad .pgp file alone and create your own .pgp file as suggested in step 5. Then, whenever you use AutoCAD, you can open the AutoCAD Alias Editor, and choose File > Open and load your personal .pgp file. From then on, the aliases in your file will supersede those of the standard Acad . pgp file. 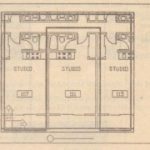 AutoCAD users can’t seem to get enough drawing space. ‘The Full Screen Auto- CAD tool is for those AutoCAD users who are never satisfied with the amount of drawing area their screen may provide. When you choose Express > Tools > Full Screen AutoCAD, the AutoCAD drawing area is pushed to the maximum area available. The AutoCAD title bar is hidden, as is the menu bar. 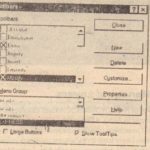 You can access the menu bar by pushing the cursor to the top of the screen until you see a diskette icon, then click and drag. The menu bar momentarily appears, allowing you to select an option. To return to the normal AutoCAD window, point to the top edge of the screen until you see the diskette icon, then click and hold to display the menu bar. Choose Express > Tools > Full Screen AutoCAD and you return to the standard AutoCAD view. . In Chapters 12 and 14, you saw how you can clip portions of an Xref or raster image so that only a portion of these objects is visible. 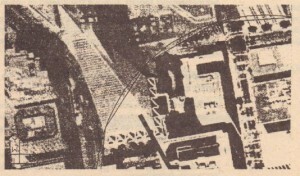 One limitation to the Raster Clip option is that you can only clip areas defined by straight lines. You cannot, for example, clip an area defined by a circle or ellipse. The Extended Clip tool is designed for those instances where you absolutely need to clip a raster image or block to a curved area. The following steps show you how it works. . Create a clip boundary using. a curved polyline or circle. Choose Express > Modify > Extended Clip. Click the Xref, block, or image you wish to dip. prompt, press button The Xref, block, or image clips to the selected boundary. You may erase the boundary you created in step 1 or keep it for future reference. Extended Clip really doesn’t clip to the boundary you created, but instead, approximates that boundary by creating a true clip boundary with a series of very short line segments. In fact, the prompt in step 5 lets you specify the maximum allowable distance between the straight-line segments it generates and the curve of the boundary you create (see Figure 19.11). Once you’ve created a boundary using Extended Clip, you can edit the properties of the boundary using Modify> Clip> Xref for Xrefs and blocks, or Modify > Clip > Image for raster images. Most of the time, the line types provided by AutoCAD are adequate. But if you’re looking for that perfect line type, you can use the Make Linetype tool to make your own. Here’s how it works. Choose Express > Tools > Make Linetype. The MKLTYPE dialog box appears. Enter myltype in the File Name input box and select a location for the file, then click OK.
At the Enter a linetype name: prompt, enter MyLinetype, or any name you want to use to describe the line type. The name must be a single word. At the Enter linetype description: prompt, enter a description for your line type. This can be a sentence that best describes your line type. At the Specify starting point for line definition: prompt, pick one endpoint of the sample line type. At the Select objects: prompt, select the sample line type lines, When you’re done, press u. You now have a custom line type. To load your custom line type, use the Linetype Manager dialog box (<Format> Linetype) to locate your line-type file and load the line type. You can also get to the Linetype Manager by clicking the Linetype drop-down list in the Properties toolbar and selecting Other. If you send your file to someone else, make sure you include your custom linetype files with the drawing file. Otherwise, anything drawn using your custom line type will appear as a continuous line and your recipient will get an error message saying that AutoCAD cannot find your line-type file. 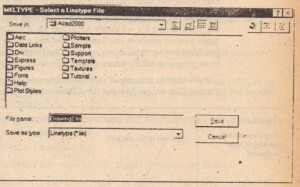 The Make Linetype tool creates a single line-type file for each line type you create. The line-type file is a simple ASCII text file. If you end up making several line types, you can combine your line-type files into one file using a simple text editor like Windows Notepad. 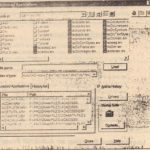 Don’t use Windows WordPad or Microsoft Word because those programs will introduce special codes to the line-type file. If you want to understand more about line-type creation and customization, see Creating Custom Line Types and Hatch Patterns in Chapter 20. Shapes are a special type of AutoCAD object that are similar to blocks. They are usually simple symbols made up of lines and arcs. Shapes take up less memory and can be displayed faster, but they are much less flexible than blocks, and they are not very accurate. You cannot use Object Snaps to snap to specific parts of a shape, nor can you explode them. They are best suited for symbols or as components in complex line types. Shapes have always been difficult to create. In the past, you could not create a shape by drawing it. You had to create something called a shape defination using a special code. A shape definition is just an ASCll file containing a description of the geometry of the shape. Creating such a file was a tedious, arcane process that few users bothered with. With the introduction of complex line types in recent versions of AutoCAD, interest in shapes has revived. To make it easier for users to create shapes, Auto- CAD 2000 offers a tool that will create a shape definition file for you based on a line drawing. Try this simple exercise to learn how you can create and use a shape. Open the Makeshape . dwg sample file. 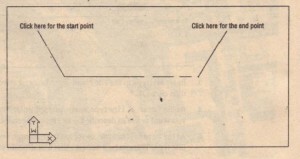 This file contains a simple drawing of an upward pointing arrow. It contains lines and arcs. Select Express > Tools > Make Shape. The MKSHAPE dialog box appears. This is a typical file dialog box allowing you to specify a name and location for your shape definition file. Enter Arrow in the File Name input box, then locate the Figures directory to place your new file there. Click OK to create your file. At the Enter the name of the shape: prompt, enter Arrow button. At the Enter’ resolution <128>: prompt, enter 5l2. Shapes are defined with a square matrix of points. All of the endpoints of lines and arcs must be on a point within that matrix. At this prompt, you can define the density of that matrix. A higher density will give you a better-looking shape, but you don’t want to get carried away with this setting. 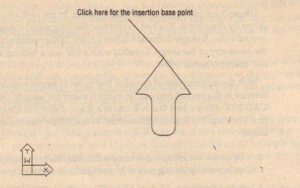 At the Specify insert on base point: prompt, select the tip of the arrow, as shown in Figure 19.13.This will be the insertion point of your shape, which is similar to the insertion point of a block. At the Select objects: prompt, select the entire arrow. Press button when you’ve selected the arrow. You’ll see a series of messages telling you what AutoCAD is doing. The last message will tell you whether AutoCAD was successful in creating the shape file and it will tell you the location and name of the new shape file. To see how your shape came out, try the following steps. In this exercise, You’ll learn how to load and insert a shape. Type Load at the command prompt. The Select Shape File dialog box appears. This is a typical file dialog box. Go to the Figures folder, locate the file Arrows. shx, and click Open to load it. At the Enter shape name or [? ]: prompt, type Arrow..J. Now you’ll see the arrow follow the cursor as you move it across the drawing area. At the Specify insertion point: prompt, click to the right of the original arrow. At the Specify height: prompt, press button to accept the default of 1. At the Specify rotation angle: prompt, enter 45.J. 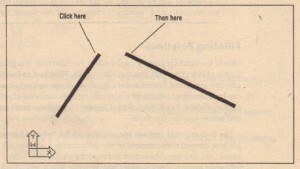 The arrow appears at a 45 degree angle. In many ways, a shape acts like a block, but you cannot snap to any of its points. It is also less accurate in its representation than a lock, though for some applications, this may not be a great concern. Finally, you cannot use complex shapes such as splines or 3D objects for your shape. You can only use lines and arcs. Still, you may find shapes useful in your application. As mentioned earlier, you can include shapes in line-type definitions. See Chapter 20 for a description on how to create a line type that includes shapes as part of the line. One of the more frequently used tools is the Fillet tool. It is great for joining endpoints of lines together. You can also use the Fillet tool to join the endpoint of a polyline and a line. Unfortunately, Fillet won’t join two polyline endpoints, This can be frustrating, especially if you are trying to join a set of polylines to form a single polyline. As you learned in Chapter 13, polylines must meet exactly end to end before you can job them. The Express tools come to the rescue with the Polyline Join tool. Polyline Join lets you connect the endpoints of two polylines in a way similar to the Fillet command. You also have the option to connect the endpoints with a line segment. The following exercise demonstrates how Polyline Join works. Open the Pl join .dWg file from the .Figures directory. Choose Express > Modify > Polyline Join, or type Pljoin. At the Select objects : prompt, select the two lines, then press button. At the Enter fuzz distance or [Jointype]: prompt,click two points to define a distance that is roughly the same as the distance between the two endpoints of the polyline as shown in Figure 19.14. The endpoints of the polylines join. Enter F button to make Polyline Join fillet two polylines or enter A button to make Polyline Join add a line segment between the two polylines. The Both option adds a line segment and fillets the endpoints of polylines. Sometimes it seems that there aren’t enough selection tools available in Auto- CAD. 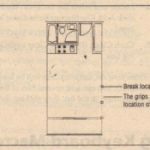 Chapter 2 described the various methods you can use to select groups of objects to build a selection set, a set of objects selected for an operation such as a Move or Copy. The Express Selection tools offer a set of tools that let you create a selection set by subtraction. These tools work by first asking you to select all the objects on a layer, or even the entire drawing. You then select the object you do not want in the selection set. Once you’ve removed objects from the selection set, you can proceed with whatever command you want to use to edit the selection set. You can use the Previous Selection option at the Select objects: prompt to use the selection set you build with the Express Selection tools. The Express Selection tools work like the standard selection options, only in reverse, Instead of adding objects to the selection set, objects are subtracted from the selection set. Here’s a view of the Express Selection tools menu showing the options available. If you prefer to type in your selection options at the Select objects: prompt, you can do so by entering the standard selection option, preceded by EX. For example, to exclude a set of objects using a window, enter EXW, then proceed to place a window around the object you want to exclude from the selection set. To exclude objects with a crossing window, enter EXC, and so on. If you’re selecting objects before you issue a command, to use grip editing for example, you can enter the selection option without the apostrophe. AutoCAD then selects everything except the selected object. Most AutoCAD users really only need to set up their dimension styles once, then make minor alterations for drawing scale. You can set up your dimension styles in a template file, then use that template whenever you create new drawings. That way, your dimension styles will already be set up the way you want them. But frequently, you will receive files that were created by someone else who may not have the same idea-, about dimension styles as you do. Normally, this would mean that you would have to recreate your favorite settings in a new dimension style. Now with the Express tools, you can export and import dimension styles at any time, saving you the effort of recreating them. Here’s how it works. Open a file from which you wish to export a dimension style. Choose Express > Tools > Dimstyle Export, or enter Dimex.. The Dimension Style Export dialog box appears. Click the Browse button at the top of the dialog box to locate and name a file for storing your dimension style. AutoCAD appends the .dim filename extension. Click Open in the Open dialog box. If the file you specified does not exist, AutoCAD asks you if you want to create it. Click OK to create a new .dim file. Select the name of the dimension style you want to export from the Available Dimension Styles list box. Click the Full Text Style Information radio button to include all the information regarding the associated text style. Click OK. A message appears in the Command window telling you that your dimension style was successfully exported. To import a style you’ve exported, take the following steps. 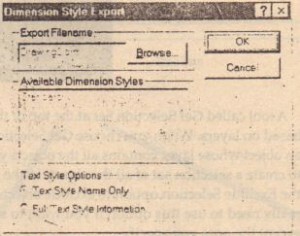 Open a file into which you want to import a dimension style. Choose Express > Tools > Dimstyle Import, or type Dimim, The Dimension Style Import dialog box appears . Click the Browse button to open the Open dialog box. Locate and select the dimension style file you saved earlier, and then click Open. Click either the Keep Existing Style or Overwrite Existing Style radio button to choose which action to take. This last set of options is less likely to get as much use as the others discussed so far, so this section includes a brief description of them without going into too much detail. They’re actually fairly easy to use, and you. shouldn’t have any trouble trying them out. Selection Tools > Get Selection Set Lets you create a selection set based on layer and type of object. You can either enter a layer or object type when prompted to do so, or select a representative object from the screen. Tools > Xdata Attachment Lets you attach extended data to objects. Extended data is usually only used by AutoLISp, ADS, or ARX applications. You are asked to select the object that will receive the data, and then for an application name that serves as a tag to tell others who the data belongs to. You can then select a data type. Once this is done, you can enter your data. Tools > List Entity Xdata Displays extended data that has been attached to an object.